Hope all is well. Tenia from Jazzy Paper Designs here to show y'all a card that I created for today and it goes a lil somethin like this.......CHECK IT!! I created this card using Mandarin Orange Twinery Twine, My Mind's Eye Together Decorative Tape, Echo Park Everyday Eclectic Designer Paper, Tuxedo Black Ink, Copic Markers and Wendy Vecchi-Studio 490-My Kind of Art stamp set. You can get ALL of this awesomeness at the eclectic Paperie store!!! Thanks for stopping by and have a great day!!! 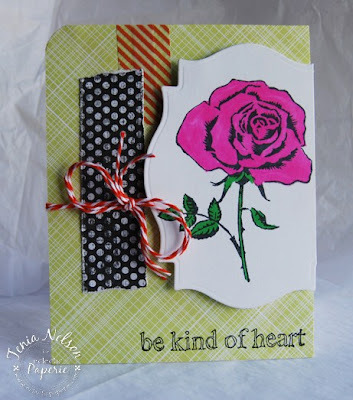 Love the bold tape and sweet flower!